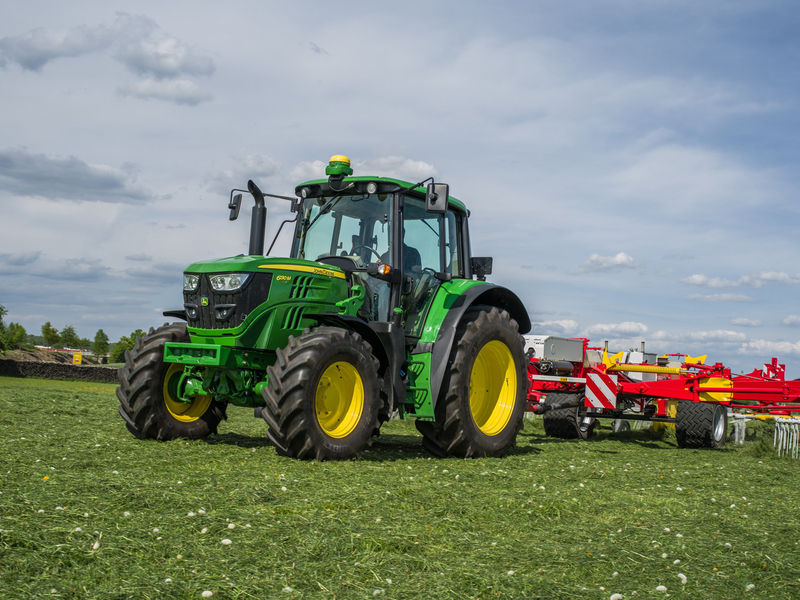 Expanding the John Deere range of mid-size 6R and 6M Series tractors, a total of 14 new four-cylinder and large frame six-cylinder models with Stage IV engines from 110 to 195hp will replace the current Stage IIIB compliant models from the end of this year. Available from November 2015 (6R) and spring 2016 (6M) respectively, these new full-frame tractors feature improved manoeuvrability, enhanced operator comfort, a wide range of transmissions and up to six SCVs, as well as a premium front hitch option. The new 6R Series four-cylinder premium tractors are powered by 4.5-litre John Deere PowerTech PSS engines rated from 110 to 135hp (97/68 EC). The six-cylinder versions feature 6.8-litre John Deere PowerTech PVS engines rated at 145 and 155hp (97/68 EC). All new 6R Series tractors are equipped with John Deere’s intelligent power management system (IPM), which adds 20 to 30hp on the four-cylinder models and 40hp on the six-cylinder versions. All John Deere PowerTech PSS engines feature series turbochargers plus diesel particulate filter (DPF) and diesel exhaust fluid (DEF) systems to comply with Stage IV emission regulations. These are designed to keep running costs at low levels and provide maximum response to load changes. To further reduce operating costs, the new Stage IV engines are equipped with a lifetime DPF, and the 6145R and 6155R tractor models also now feature a 750 hour engine oil change interval. A wide range of transmission options makes John Deere’s 6R and 6M Series tractors versatile workhorses for arable, livestock and mixed farms as well as contracting businesses. Depending on the model, 6R Series tractors are available with the proven PowrQuad Plus powershift or AutoQuad Plus/AutoQuad Plus Ecoshift transmissions, the AutoPowr continuously variable transmission or the advanced DirectDrive double-clutch transmission. John Deere’s new 6M Series tractors from 110 to 195hp feature a choice of PowrQuad Plus, AutoQuad Plus/AutoQuad Plus Ecoshift or the all-new CommandQuad Plus/CommandQuad Plus with Ecoshift powershift transmissions. Models from 110 to 155hp in this range will also be available with an optional creeper transmission to meet the needs of specialist crop producers. Setting new standards of operating comfort, the latest 6R Series models feature CommandARM controls, an optional programmable electronic joystick for hydraulic applications and the Generation 4 CommandCenter touch screen monitor, which has a swipe function display for more intuitive, tablet style operation. The redesigned TLS+ front axle suspension on this range provides improved steering and driving on the road. The new 6M Series tractors are now available with a maintenance-free mechanical cab suspension which delivers smoother operation as well as reduced stress and vibration levels, and allows a 10 per cent higher operating speed even on rough terrain. The same enhanced TLS+ triple link front axle suspension system provides additional operator comfort and more traction under tough working conditions. The 6R Series tractors offer up to six SCVs with individual pressure relief levers and a premium front hitch, while three mid-stack SCVs are also available to provide fast and responsive handling of implements. The 6M Series tractors can be equipped with three rear SCVs and a new PowerBeyond function, or four standard SCVs with three mid-stack SCVs. The PowerBeyond hydraulic system is used as a pressure/flow source for additional functions equipped with independent flow control valves. An electrical loader-ready joystick is also available for use with John Deere’s new R Series front loaders (see separate release). Both the 6R and 6M Series tractors are specifically designed to accommodate these versatile new loaders, which feature new mounting frames and hood guards and are easy to attach and operate.